I am slowly trying to read every L.M. Montgomery book and review them all on this blog! So, I found this one that I had never read before. I love the cover art in the edition I got. However, this book has sat on my bookshelf untouched for many months before I finally picked it up the other day. 2 stars: It was okay, I guess. My least favorite of hers so far. Pat Gardiner lives at Silver Bush, along with her family and the family's old nurse Judy who has been with them forever and ever. Our little Pat is a precocious girl, who is fiercely attached to everything and everyone that she loves: each member of her family, Judy, and Silver Bush itself. She is violently opposed to change of any kind coming into her world, but particularly change that effects any of the inner circle. In fact, she despises change so much that she is inconsolable when her father shaves off his mustache, and quite distraught when her favorite aunt gets married. Yes, little changes and even happy events cause no small amount of heartache to Pat. She does get over such things, eventually, and sometimes even comes to prefer the new state of things to the old. Not that she will readily admit it. No matter what happens, though, Judy is there to give her counsel, tell her ghost stories, or comfort her. Judy is the rock around which her little world spins. Thank goodness for Judy! I had a hard time getting into this one. One obstacle was Judy's speeches. She was almost more of a main character than Pat, and had quite a bit of dialogue on nearly every page, all of it written in dialect form. It took some getting used to. You almost had to read some of the passages out loud to figure out what she was trying to say. So that was distracting and kept pulling me out of the story. Secondly, and I almost hate to say this, but I didn't care for Pat all that much. She was so deeply affected by every little thing and would get so upset about it. I had to just shake my head a lot. She would be difficult to live with in real life, that's for sure. If you couldn't so much as rearrange the furniture without her heart breaking over it; as a parent, I would have a hard time putting up with it. Or I would I laugh at it, which no doubt would make her my mortal enemy. Judy's sayings were at times funny, but she really stole the spotlight for most of the book. 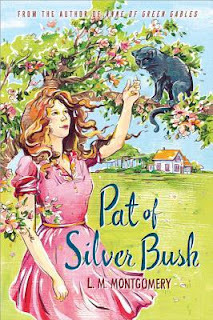 I think it should have been called "Judy of Silver Bush," really. She was much more interesting than poor little Pat of the deep emotions. I think I will read Mistress Pat, just to check it off my list, but I'm not looking forward to it much. (A sad thing to say about any L.M. Montgomery book.) Maybe the sequel will redeem the first.